The information generated by a population and housing census – numbers of people, their distribution, their living conditions and other key data – is critical for development. Without accurate data, policymakers do not know where to invest in schools, hospitals and roads. Those most in need remain invisible. Yet too many countries have outdated or inaccurate information about their populations. A census is among the most complex and massive peacetime exercises a nation undertakes. It does not merely count people; it can also measure fertility, mortality and movement, helping to predict demographic trends. And it can uncover inequalities in employment, education and wealth. UNFPA aims to make sure no country fails to carry out a census because of financial or technical constraints. UNFPA provides technical support during all stages of a national census, and helps ensure the data are widely utilized and disseminated for development. PANAMA CITY — Fourteen countries in Latin America and the Caribbean are carrying out population and housing censuses this year as part of the 2010 round, a global effort by governments to count their citizens, which happens every decade in most countries. YEN HA VILLAGE, Viet Nam — May 19 was a special day for Thuy and her husband Nghe. Their son was one month old and, as dictated by Vietnamese tradition, they invited their relatives for a party. It was a big reunion, with more than 15 people celebrating the arrival of the new baby. And because it was a baby boy, after three girls, the celebration was all the more heartfelt. JAKARTA, Indonesia — With about a quarter of a billion people, Indonesia is the world’s fourth most populous country.Throughout the month of May, some 700,000 enumerators will fan out across 90,000 villages in 33 provinces to give a more precise figure to the estimate of the country’s population. Today, with major demographic shifts occurring and attention focused on international development, accurate and timely data are more important than ever. The unique advantage of the census is that it represents the entire statistical universe, down to the smallest geographical unit, of a country or region. Planners need this information for all kinds of development work, including: assessing demographic trends; analysing socio-economic conditions; designing evidence-based poverty-reduction strategies; monitoring and evaluating the effectiveness of policies; and tracking progress toward national and internationally agreed development goals. The information also helps raise awareness about population issues among government decision-makers and the public at large. Additionally, a national census is often the only source of information for identifying forms of social, demographic or economic exclusion – such as inequalities by racial, ethnic, religious or other characteristics. The census also provides data on disadvantaged regions and vulnerable groups, such as the poor, the young, the old, people living with disabilities, and women and girls. Censuses can empower local communities by giving them access to this critical data. And it can encourage participation in local decision-making by increasing knowledge of communities’ needs and by ensuring representation based on accurate numbers. A traditional population and housing census requires mapping an entire country, deciding what technologies should be employed, mobilizing and training legions of enumerators, conducting a major public awareness campaign, canvassing all households, collecting individual information, compiling hundreds of thousands – or millions – of completed questionnaires, monitoring procedures and results, and analysing, utilizing and disseminating the results. Though it is a very laborious and costly operation, it is a vital one. 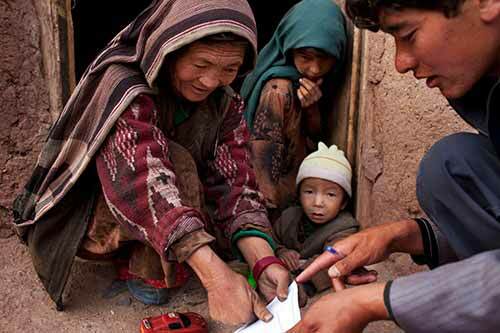 Only a census can provide the fine-grained and accurate data needed by analysts and policymakers to make informed, evidence-based development policies. It is recommended that a national census be conducted every 10 years to make comparable information available. A series of censuses allow experts to assess the past, describe the present and estimate for the future. Censuses are conducted in “rounds.” The 2020 census round comprises censuses taking place between 2015 and 2024. Because so much depends on the data produced, the process can become highly charged and requires careful monitoring. And because a census exercise typically occurs once every decade, it is hard to retain expertise in national statistical offices between censuses. By the time a new census rolls around, many experienced demographers or statisticians have moved on to retirement or the private sector. Census taking is also very costly. Creating partnerships with major stakeholders, including civil society and the private sector, is crucial for the successful implementation and continuity of censuses. Conflict situations in many countries pose additional challenges, as well. And despite the essential role of census data in evidence-based development plans and poverty-reduction strategies, they are not always converted into information that is useful for designing the most cost-effective and accurately targeted policies – a challenge UNFPA works to address. Supporting countries in the collection, analysis and dissemination of census data for development is a critical part of UNFPA's mandate. UNFPA plays key roles in coordinating technical and financial assistance for censuses. This support can include resource mobilization, the provision of chief technical advisers, training in technical communication and advocacy, operating publicity campaigns, as well as developing census budgets, road maps, and instruments such as questionnaires and manuals. UNFPA is also a member of the joint governing body of the International Committee on Census Coordination (ICCC), a group that supports the implementation of housing and population censuses in developing countries. UNFPA is currently the chair of the ICCC. Last updated 11 August 2016.